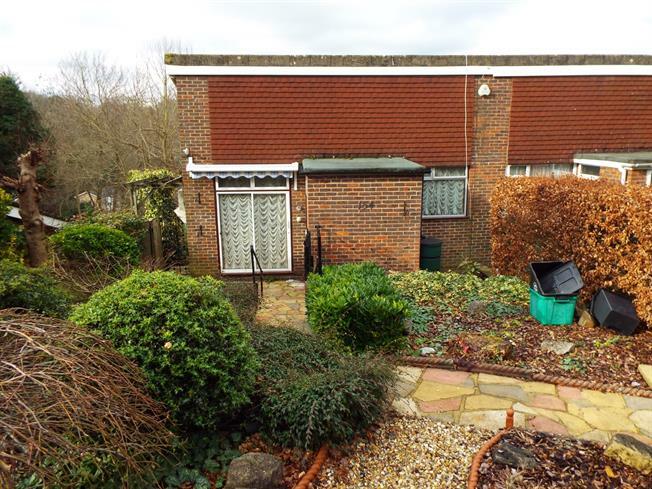 2 Bedroom End of Terrace House For Sale in Westerham for Asking Price £299,950. This end of terrace two bedroom home has very spacious living area, the property is in need of improvements, the accommodation comprises, porch, hallway, good size and fitted kitchen, very spacious conservatory off both the lounge and kitchen, two bedrooms, shower room, tiered garden with pleasant views, garage en-bloc. Door, window, cupboards, further door to hallway. Doors to bedrooms and shower room, built in cupboard, steps down to living room. Windows to front and rear. Window to rear, shower cubicle, low level WC, hand wash basin. Window to side, fireplace, opens to conservatory, also to kitchen. Good size kitchen, patio doors to conservatory. UPVC conservatory over looking tiered garden. Garden tiered down on three levels.